It's time to take Understanding Media (1964) and The Medium Is the Message (1967) off the shelf and reread them. If you haven't delved into Marshall McLuhan's media studies, it's never too late to learn. McLuhan was a Canadian sociologist who researched mass media while on the faculty at the University of Toronto. His core conclusion was that choice of media affects how the audience perceives the message. McLuhan's books were bestsellers, and he became kind of a media star to the point of portraying himself in a cameo role in the 1977 Woody Allen film Annie Hall. Producer/director Steven Jack intuitively arrived at the same conclusion as McLuhan when he decided to convert the History vs. Hollywood, which airs on The History Channel, from video to Super-35 film production. Jack also recruited cinematographer Pete Konczal, who is best known for cutting-edge commercials and music videos, to bring filmic sensibilities to the documentary series. Each episode of History vs. Hollywood is an hour-long exploration of a filmmaker's interpretation of history. Every program emulates the production values of the movie, and the programs air in wide-screen, letterboxed format. Recent subjects have included Gods and Generals, Gangs of New York, The Last Samurai and Master and Commander. The History Channel airs new programs in the series four times a year in conjunction with the release of the feature films. Each program incorporates conversations with the filmmakers and historians who comment on the authenticity of the movie. Jack has been working in the television industry since 1985, and has been associated with The History Channel for the past eight years. When the series first aired some four years ago, the interviews were videotaped much like a TV news anchor talking to a source in a studio. Jack felt that the choice of media diminished their impact. "Our goal is to encourage viewers to read more about what they've just seen," he says. "We decided to use cinematic techniques to capture the mood and spirit of times, places and historical events depicted in each movie. The response we're getting from the audience, especially history fans and film students, reaffirms we are doing the right thing." Konczal recalls his first meeting with Jack. It was apparent to him that Jack felt passionate about movies and the role they play in society. "We spoke about everything from wardrobe to shooting on film with the new 35mm ARRICAM, including such subtleties as using tobacco filters in the upcoming Gangs of New York program," he says. "Steven wanted to challenge the movie cinematically. We decided to shoot Super-35 and air in wide-screen format for the most cinematic look." Jack observes, "Film has a texture and the latitude needed to create moods and a sense of time and place, so we can take the audience on a journey that is not just informative but entertaining as well." He cites interviews with director Peter Weir and Russell Crowe for the Master and Commander program filmed onboard a ship just outside the San Diego area that was used during the making of the movie. "Pete put the camera on the jib arm of a crane on a nearby barge," Jack says. "The camera panned to the left and revealed a beautiful 19th century frigate in the distance with the sun creating wonderful backlight. The sail was specially created with an enormous ‘H,' the logo for The History Channel. The camera pushed all the way from a small barge into a medium shot of the host, who was on the front of the boat. It was a long shot that took about a minute-and-a-half. The drama of the shot pulled the audience right into our story." Konczal and Jack referred to pictures from the period, but most of their preparation for Gangs of New York consisted of walking through the locations where the story happened. "Steven wanted to stay within the realm the movie, even the color palette," Konczal says. "[Cinematographer] Michael Ballhaus' lighting was very warm and rich. There's so much brick in that part of town with the brownstone buildings that we wanted to take it another level by soaking more color into the negative. We used a combination of tungsten light and a tobacco No. 2 filter to enhance warmth." Jack recalls that it took several weeks to schedule an interview with director Martin Scorsese. They were slated to shoot early on a Friday afternoon in a downtown bar on Mulberry Street. He and Konczal planned to film the director standing in front of a large window with the street scene visible over his shoulder. They had the camera and crew set up, when Scorsese's office called with a change of plans. It was a busy day for the director, but he could give them 30 minutes in a conference room next to his office. "When Pete and I walked in, we knew that was the wrong setting," Jack says. "We talked our way into Scorsese's screening room, and put him in a big, over-sized, green chair with the glass window of a projection booth visible behind him. That set the mood for the conversation." Jack says that once they identify a topic for a program, a small research department generates volumes of material, which he weeds through and figures out how he wants to approach that story. At that point, he speaks with Konczal about creating a visual sensibility that drives the creative process. "It's a great deal of work with what we think is an even bigger payoff. It is unique and entertaining in a way that is atypical for many documentaries," Jack says. "For Gangs of New York, we had a scene with the historian and host outside the oldest tenement building in what used to be called Five Points [today's Chinatown]. The camera followed them inside, with no cut-aways. It's one long take with the historian filling in all the blanks, telling the audience exactly what year the tenement was built, and what it was like living there." They walked through this scene a few times before it was filmed, but not to the point of looking staged. Jack explains, "You can't script historians like actors. I give them parameters and freedom to go in different directions. There is a lot of improvising. You are walking with him through this narrow hallway 100 feet to the back of the building, and up a back staircase. They knock on an apartment door and enter a very small room. The resident allows us in and we get to show the audience around. That shot is three-and-a-half-minutes long, but you stick with it, because it takes you somewhere both visually and conceptually." Another sequence was filmed at O'Neil's bar on Baxter Street. The scene begins with the historian standing on the street in front of the bar. The camera was on a Steadicam, which was inspired by the way Scorsese and Ballhaus moved the camera in their films. They began shooting the scene in the dim light of dusk. Konczal had the street wet down as though it was a rainy day. That created a reflective surface for ambient light. The camera followed the historian into the bar and through the crowd, while he spoke about what occurred in that place in the distant past. He walked down the stairs, through a couple hallways, into the kitchen and finally came to a long, dark tunnel with a flickering light at the end. The historian walked through a hidden tunnel to a gate, where he told the audience that this was where corrupt police officers smuggled prisoners onto the street. "Gods and Generals was probably the most ambitious of all the shows we've done, so far," Konczal says. 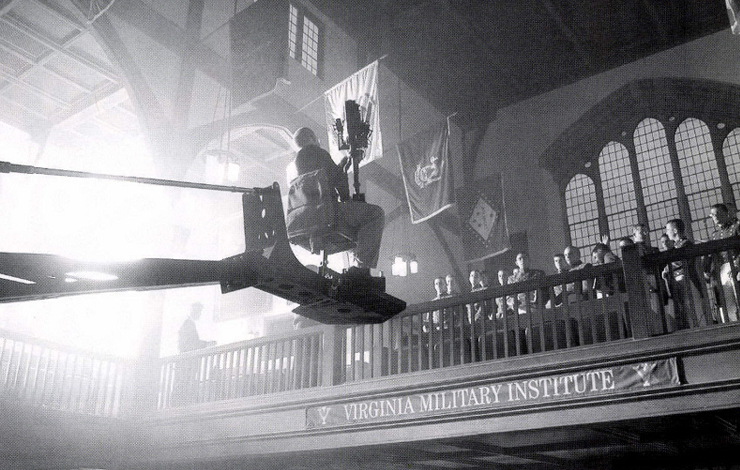 "We opened that film with a Steadicam operator on a crane outside a cathedral at the Virginia Military Institute [VMI]. The crane swooped down to the ground and the operator stepped off and entered the front door where we met the host. The VMI choir was dressed in the same attire they would have worn during the Civil War. We also interviewed Ted Turner, the producer, and writer/director Ron Maxwell." Other scenes were filmed at the historic Chancellorsville and Fredericksburg battlefields, including aerial shots made with a Westcam, which followed the host as he spoke about the realities of each phase of battle and how they were depicted in the film. Konczal says that he typically records about 50,000 feet of film for each program, using the same camera and lighting tools and palette of negatives that he employs to shoot commercials and music videos with high production values. For instance, Available Light, in New York, provided helium balloons that he used to quickly position realistic light for big exterior scenes on Gods and Generals. The CSC camera rental company in New York provides the ARRICAM and spherical lenses. Konczal says that the flexible 35mm camera enables him to easily use different shutter speeds in appropriate scenes to give the images a little more edge that separate it more from the standard documentary-type filming. "It's a technique that is often used in music videos," he says. "In Master and Commander, we had scenes with water splashing. When you shoot at a higher shutter speed, it sharpens those little beads of water and the sparks flying out of gun barrels." He also takes a painterly approach to choosing films, ranging from the new 500-speed Kodak Vision2 5218 film, which he chooses for many night and darker interior sequences, to Eastman EXR 200T 5293 film, one of the oldest films Kodak sells. Konczal used the 5293 stock on Master and Commander to emulate an older, classic film look. Those nuances run counter to the notion that anyone can put a digital camera on his or her shoulder, point it in the right direction and shoot a documentary. Jack and Konczal believe that the visual styles they are creating for each film in the History vs. Hollywood series is germane to the stories they are telling. There is also an X factor. All the negative they expose, including outtakes, is being properly archived by The History Channel. Jack believes the negative and soundtracks will pay dividends when, for instance, filmmakers need stock footage of battlefields where the Civil War was fought or Martin Scorsese talking about what was in his mind when he created Gangs of New York.